I’ve tackled the issue of storage space on the Xbox One a few times, and during that time I’ve seen more than one approach to solving it, as from external plug-in drives, to more form-fitting systems like the Fantom sidecar I reviewed earlier this year. If there’s one thing they have in common, it’s the USB 3.0 interface. Whether you are plugging something in to rest on top of the case, or augmenting the case altogether, you are solving your storage woes with a drive you’ll connect to a port on the system. As games get larger, and the worlds like Assassin’s Creed Odyssey boast more open-world play space than ever before, there’s just as much need for fast as there is big. Seagate has partnered with Microsoft directly and is looking to solve that problem with their Game Drive. I decided to spruce up the storage space on my Xbox One X and my launch Xbox One to see how dropping some solid state storage into my life would improve my loading times. 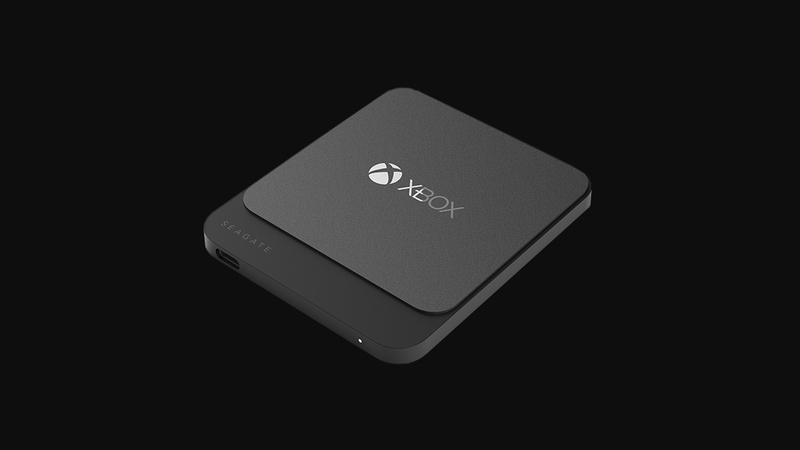 Taking the device out of the box, it was immediately clear that this was an officially licensed product, as it shares the same sleek aesthetic of the newly-designed Xbox One X. Quiet and smaller than a deck of cards, the 1TB capacity drive (the drive also comes in 500GB and 2TB varieties) blends in beautifully with the system. Given that SSDs have no moving parts (it’s kinda in the name — Solid State Drive), it also won’t add any sound to the liquid cooled silence of Microsoft’s new console. Compared to previous generations of these drives, the new system is lighter and almost perfectly square. That doesn’t make much of a difference, but the next improvement certainly did. Almost every external drive sold that uses USB 3.0 today utilizes a proprietary elongated-ended USB 3.0 plug that looks a bit like a micro-B and USB mini-A were welded together. It’s unwieldy and always feels like a failure point waiting to happen. Seagate has thankfully moved to what is rapidly becoming the industry standard — USB-C. USB-C is omnidirectional, meaning it can be plugged in either way, so no more worries about accidentally jamming the cable in upside down, damaging the port. It also means that you can more easily replace it with a longer cable, should that be required. The drive is spacious, true, but it’s the speed that matters. Also inside the box, as a nice added bonus, is a free two month membership to Xbox Game Pass. Microsoft is pushing this new service hard, and with good reason — it’s an excellent way to try out a whole raft of excellent games, and quite a few brand new games are coming to the service on the day they are launched worldwide. With access to over 100 games the moment you redeem this free pass, you’ll be happy you have the extra terabyte of storage that the Seagate Game Drive provides. Plugging the drive in, as with any external drive, the Xbox One immediately recognizes the drive and asks whether you’d like to format it for media or game use. Naturally, the answer is games. After a quick format, you’ll be asked if you’d like to install everything to the new drive by default. This does nothing for your current crop of games, so after the drive is read, you might also want to move your existing games to this new hard drive. The aforementioned Fantom system utilized a Seagate Barracuda 5TB hard disk with a rotational speed of 5400 rpms and a 128MB cache — something like what you’d find in a laptop. The theoretical maximum throughput of the drive is 140MB/s, but in practice our numbers came in low 90MB/s range. Pushing up to a 7200 rpm drive would have, in theory, added about 33% more speed, but jumping all the way to an SSD is another beast entirely. An SSD connected via a USB 3.0 port has a theoretical read speed of 512MB/s and a write speed of 500MB/s. Granted, most of the time you’ll be reading and writing smaller files other than during installation, but in games that stream assets, such as open world games, or more frequently in 4K games where the art assets are getting larger and larger, sustained reads are becoming increasingly more common. As you can see below, the drive performs remarkably well, hitting its stride almost immediately and then staying near the theoretical maximum for read and write the entire time. Subsequent retests yielded the same results. Suffice it to say, without the need to deal with rotational storage edges and platter density, Seagate’s Game Drive is able to keep up with everything I could throw at it. This really makes a difference in visual quality as assets are able to stream into the environment faster, causing less texture pop-in. This does bring us to the one sticking point — the price. Rotational storage is painfully cheap, and Seagate sells a 4TB mechanical hard drive for $99 as of the time of this writing. SSDs are still somewhat expensive, though, and the 2TB, 1TB, and 500GB capacities come in at an MSRP of $600, $300, and $150 respectively. It’s a lot to pay for performance, but it’s clearly a performance promise that Seagate is happy to deliver on. I’m always happy to see a manufacturer stand behind their product. Seagate has warrantied this drive for 3 years — that’s three times as long as most external hard drives, and a good sign of product confidence. With consistent read and write speeds, the Game Drive for Xbox from Seagate delivers unrivaled speed for anyone looking to expand their Xbox library, while lowering their load times. It comes at a cost, but there’s no denying the results.